2. Remove the fuse box cover by pressing the tap and pulling up. 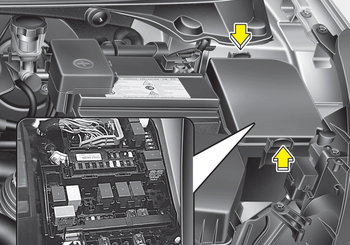 When the blade type fuse is disconnected, remove it by using the clip designed for changing fuses located in the engine room fuse box. Upon removal, securely insert reserve fuse of equal quantity. 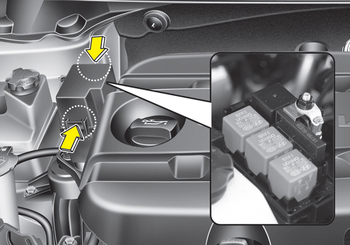 After checking the fuse box in the engine compartment, install the fuse box cover securely. If not, water leaking may cause electrical failures.